For ease and fulfilling the client’s necessity, many users prefer to move to Outlook platform. Outlook platform is easy to manage and is often used by professionals to maintain the communication. 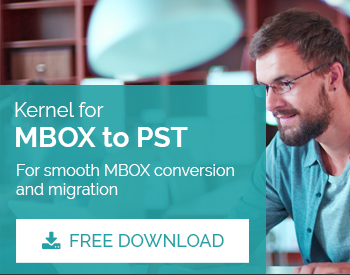 If any user is willing to migrate mailbox from Sylpheed to PST, then an advanced mbox to pst conversion tool is required. 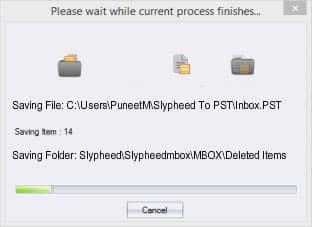 Sylpheed is the MBOX client; therefore, and so an ideal email conversion tool must be selected that can effectively convert the respective file items to Outlook PST without affecting the integrity of data. Select ‘Sylpheed’ from the different MBOX clients provided by the interface. 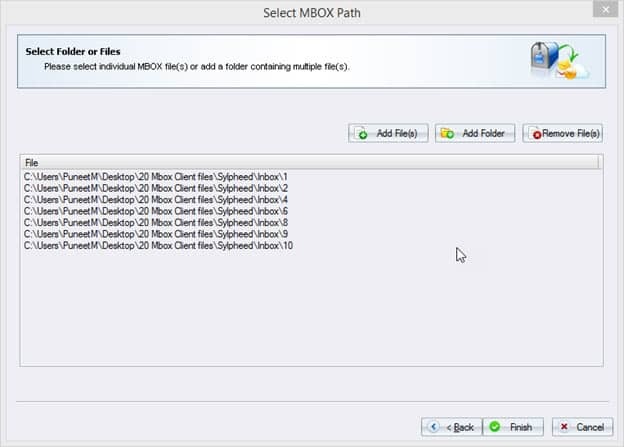 Add Sylpheed MBOX files to the interface using ‘Add File(s)’ button. The files that you don’t wat to migrate can be removed by using ‘Remove File(s)’ button. Click ‘Finish’ once file addition is complete. A new window in interface will get open presenting detailed information on the selectively added Sylpheed MBOX files. To save them, click ‘Save’ button located at the top of the interface. A conversion options appear on the screen. 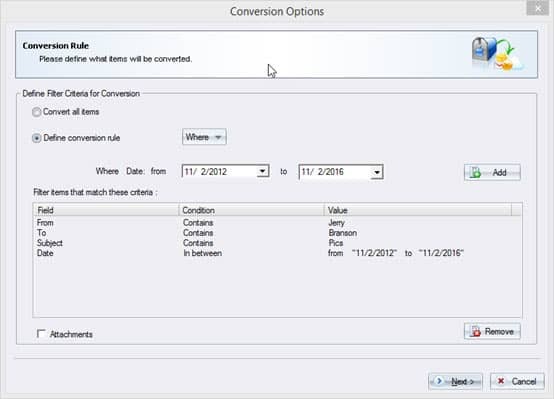 It presents ‘Convert all Items’ and ‘Define Conversion Rule’. 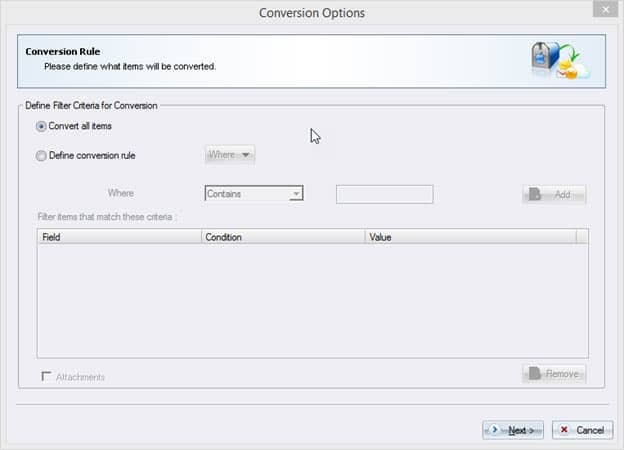 To save entire items just click on ‘Convert all items’ followed by ‘Next’. To save any specific items of Sylpheed MBOX file, select ‘Define Conversion Rule’ where different parameters like From, To, Subject and Date have to be selected from ‘Where’ drop-down menu. Note: ‘From’ field indicates the ‘Sender’ of the mail. ‘To’ field indicates the ‘Receiver’ of the mail. ‘Date’ field indicates the ‘Date-Range’ in which the mail would have been sent. State a value that is either contained or is not contained in the “From” field. Similarly, specify a value contained or not contained in the “To” field. Also, provide the required value for “Subject” field. Finally, specify the date range using “date” field. Click ‘Next’ to proceed to saving option. In the next step click ‘Save in PST’ available as among other options like ‘Save in EML’, ‘Save in MSG’, and ‘Save in Office 365’. 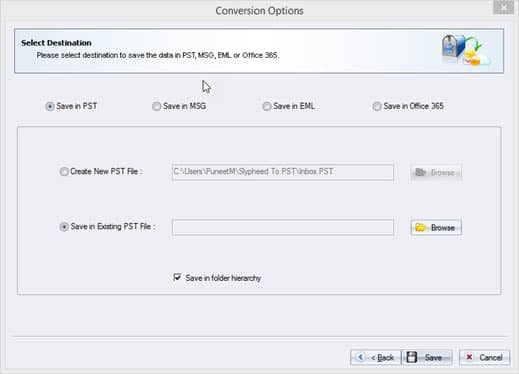 Choose among ‘Create New PST File’ and ‘Save in Existing PST File’. 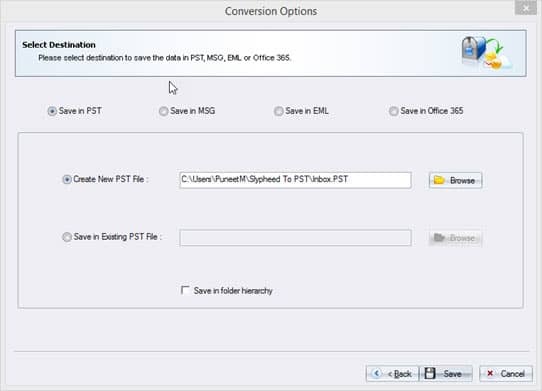 To save in new PST file, select option “create the PST file” and provide the newly created PST file path using ‘Browse’ option. To save in pre-existing PST file just provide the destination path using ‘Browse’ option and proceed. Once saving options are finalized, check the box that reads ‘Save in Folder Hierarchy’ and click ‘Save’. 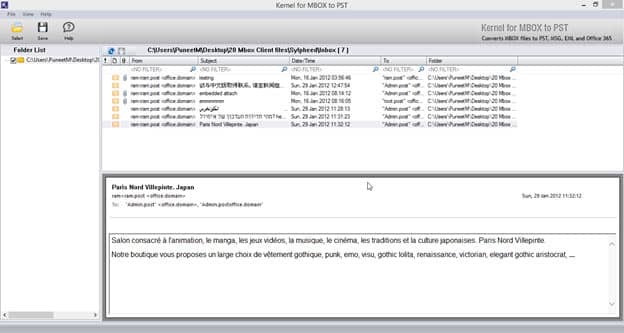 Once completed the interface shows the dialog box indicating the successful completion of mailbox migration. 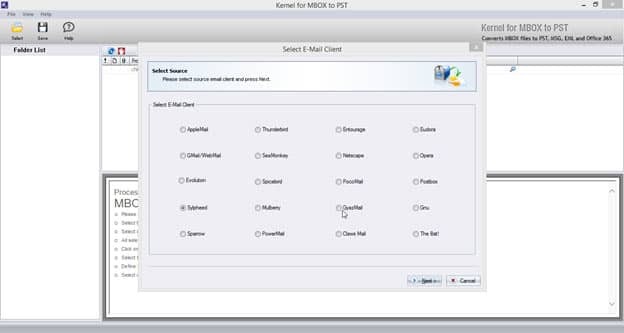 How to Export MBOX from Gmail?